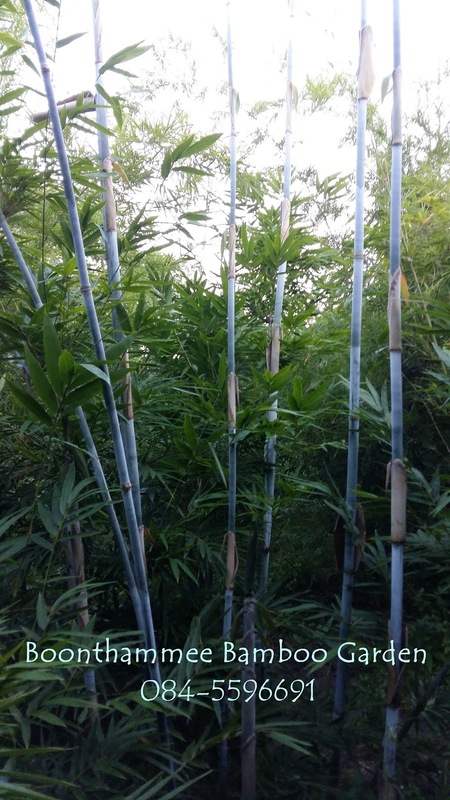 The following is an overview of almost all bamboo species and varieties cultivated in our nurseries, Baan Sammi Bamboo Garden (BSBG), Doi Saket District, and Boonthammee Bamboo Garden (BBG), Hang Dong District, Chiang Mai, northern Thailand, both locations at about 300 m altitude. Therefore, most of these bamboo plants are from tropical and subtropical regions (mainly from Thailand and adjacent countries), and a few are from temperate climates. Sooner or later, all these bamboo plants will become available for sale. 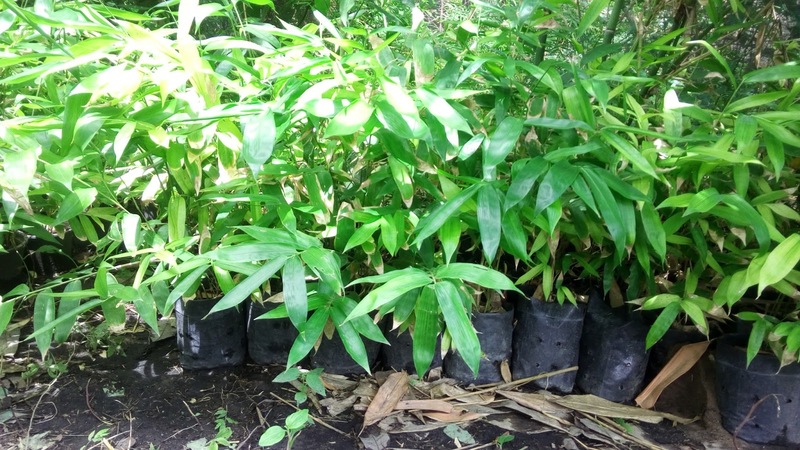 Bamboo plants that are currently available for sale will be listed in the Bamboo Plants Catalog (creating the listings of the Catalog will start in May and possible be finished in June 2016, thereafter updated when needed). For each species/variety, a photo album is available, or will be made available over the coming months. If a link to photos is given under a certain thumbnail photo in this listings below, the album is available. If there is no link, the album is under construction. Photo albums with photos of a certain bamboo species can also be found in flickr. For most species/variety, more information is available from Bamboos of Thailand. Ampelocalamus scandens — Clambering bamboo, from southern China. Bambusa arnhemica — Tall bamboo, native to tropical Australia. Bambusa bambos, Bambusa arundinacea — ไผ่ป่า (phai pa) — Tall thorny bamboo, 20 m and taller, widespread in South-East Asia. Best for ecological planting and soil stabilization on slopes and moist sites, for tall visual screen, windbreak, or impenetrable barrier along boundaries. Culms for construction, shoots edible. Bambusa "beecheyana" — ไผ่กิมซุ่ง (phai kim sung), ไผ่ลืมแล้ง (phai luem laeng), ไผ่ตงลืมแล้ง (phai tong luem laeng) — Height over 10 m, diameter over 10 cm. Branches on lower culm develop thorns. Easy growing, moisture-retentive soil, full sun. Shoots delicious, emerging late, planted for commercial shoot production and biomass production, very drought resistant. Bambusa beecheyana, Dendrocalamopsis beecheyana — 吊丝球竹 (diào sī qiú zhú) — ไผ่บีเชย์ (phai biche) — This is true Bambusa beecheyana, which has no thorns. Plant introduced from China in 2012. Bambusa blumeana — 簕竹 (lè zhú) — ไผ่สรีสุก (phai si suk) — Blume's Giant Thorny Bamboo — A thorny giant bamboo, height 18 m, diameter 15 cm; dense clumper; culms erect, bending, branching throughout; widely planted in lowland Southeast Asia including Thailand. An old clump forms an impenetrable thicket, making harvest difficult. Easy growing, moisture-retentive soil, full sun. 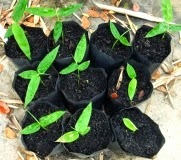 Planted for shoot and culm production. Shoots delicious, culms used for many construction purposes. Plants for windbreak and barrier along boundaries. Bambusa blumeana 'Si Khong Phrasong' — ไผ่สรีสุก สีของพระสงฆ์ (phai si suk si khong phrasong) — Culms bright yellowish-orange when young, dull yellowish when old. Bambusa boniopsis — A low bamboo from China, similar to B. multiplex, useful for hedges and screening. Bambusa "burmanica" — ไผ่กินดิบ (phai kin dip), ไผ่บงหวาน (phai bong wan), ไผ่บงหวานเมีองเลย (phai bong wan mueang loei) — A species closely related to Bambusa burmanica, but smaller in height, only about 7-9 m tall by 4 cm diameter; tight clumper, habit erect, slightly bending above, branching throughout. Culms thick-walled or solid. Easy growing, moisture-retentive soil, full sun, tolerates some drought and light shade. Shoots delicious, can be eaten raw. Plants for low to medium-sized natural hedges, visual screens, solitary or group planting. Culms for tools and light construction. Bambusa "burmanica" — Special Selection — ไผ่กินดิบ (phai kin dip), ไผ่บงหวาน (phai bong wan) — A selection which produces many and big shoots of very sweet taste. Bambusa eutuldoides — 大眼竹 (da yan zhu) — A Chinese bamboo, similar to Bambusa multiplex, but less tight, more vigorous and taller, branches from base up. Height 6-12 m, diameter 4-6 cm, somewhat drought resistant. Plants used as low screen, hedge, and for erosion control along river banks; culms for light house construction, and farm appliances. Bambusa farinacea — From the Malay Peninsula. Bambusa fecunda — From Taiwan. Bambusa gibba — 坭竹 (ni zhu) — Vigorous clumper, similar to Bambusa eutuldoides but culms more erect, dark green, branches from base up. Height 8-10 m, diameter to 6 cm. Culms for oil extraction, scaffolding and making farm and fishing appliances; plants for medium-sized to tall hedges, natural fences and screening. Bambusa glaucophylla, striped leaves — ไผ่ลายเงิน (phai lai ngoen) — Malay Dwarf Striped Bamboo — Height 3-4 m, diameter 1.5-2.5 cm; dense clumper; habit erect, bending, branching throughout. A low bamboo with variegated small leaves for every garden. May occasionally revert to the wild form with larger green leaf foliage and taller culms. Easy growing, moisture-retentive soil, full sun, tolerates light or partial shade and some drought. For low or medium-sized trimmed or natural hedge, or solitary. Suitable as a container plant. Bambusa glaucophylla, green leaves — ไผ่ลายเงินใบสีเขียว (phai lai ngoen bai si khiao) — Green Malay Dwarf Bamboo — Grows somewhat taller than its striped-leaf variety. Suitable for hedges. Bambusa lako — ไผ่ดำติมอร์ (phai dam timor) — Timor Black Bamboo — The best ornamental clumper with glossy black culms. Height 10-15 m, diameter 5-9 cm, habit straight erect, slightly bending above, no low branching. Easy growing on heavy, somewhat moist soil, in full sun or light/partial shade, best on a sheltered site, not exposed to strong winds. Shoots emerge green, turning into black in the same year, occasionally with a narrow green stripe. A feature bamboo, solitary or in a group, suitable also for small gardens. Culms used for furniture-making, interior decor, and light-weight construction. Bambusa lapidea — 油簕竹 (yóu lè zhú) — Height 7-17 m, diameter 4-7 cm, culms erect, bending above. From southern China. Part shade and full sun, on moisture-retentive soil. Frost resistance to -2 °C was recorded. Culms for construction, scaffolding, agricultural implements, lodges and booths. Bambusa longispiculata — ไผ่ลำมะลอก (phai lam malok), ไผ่ยายกอ (phai yai ko) — Height 12-15 m, diameter 4-8 cm, open clumper, culms dark green, glossy, without branching on lower culm; culm internodes glabrous. Shoots for food, culms for construction, furniture and basketry, plants for landscaping. Bambusa maculata — ไผ่อังกะลุง (phai angkalung) — From Indonesia and the Malay Peninsula. Culms used for making music instruments. Bambusa malingensis — Sea Breeze Bamboo — From China. Bambusa multiplex — ไผ่จีน (phai chin) — Tropical Hedge Bamboo — Height 3.5-5 m, diameter 1-2 cm; dense clumper; habit erect, strongly bending, almost arching. A widely cultivated low bamboo for every garden. Culms and foliage leaves green; culms turning to orange-yellow in full sun but remain green in shade. Easy growing, moisture-retentive soil, full sun or light shade, tolerates deep shade and some drought. For low to medium-sized natural hedges or visual screens. The best bamboo for low (2-3 m high) trimmed hedges. Also attractive as a solitary or in a group. Does well as a container plant. Bambusa multiplex 'Alphonse Karr' — ไผ่สีชมพู (phai si chomphu) — Alphonse Karr Hedge Bamboo — Height 3-5 m, diameter 1-1.5 cm; dense clumper; culms erect, slightly bending. A feature bamboo of low height for every garden. Green-striped pinkish shoots become yellow or orange-yellow culms with random green stripes of variable width. Leaves green. Easy growing, moisture-retentive soil, full or partial sun, light or dense shade, somewhat drought resistant. For low to medium-sized dense hedges or visual screens, or as a solitary. Does well as a container plant. Bambusa multiplex 'Stripestem Fernleaf' — ไผ่เสฉวน (phai sechuan) — Stripestem Fernleaf Hedge Bamboo — Small plant, usually less than 2 m, diameter 1 cm; dense clumper; habit erect, V-shaped, small leaves, culms yellow with green stripes. A very low ornamental bamboo with fern-like leaves, might occasionally revert to larger foliage. Slow-growing, moisture-retentive soil, best in light shade. Can be planted as a low hedge, or solitary. Does well as a container plant. "Bambusa nana" — ไผ่เลี้ยงดำ (phai liang dam), ไผ่เลี้ยง (phai liang) — Height up to 15 m, diameter 5 cm; dense clumper; habit erect, slightly bending outward, no low branching. 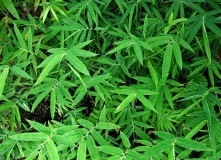 An outstanding bamboo of beautiful habit, highly appreciated in Thailand, new shoots cinnamon-colored, foliage leaves small and narrow, mid to dark green. Culms straight and dark green, may fade basally to whitish with age; thick-walled with basal part nearly solid. Easy growing, moisture-retentive soil, full sun, tolerates light shade. For medium to tall-sized visual screen, row, group, or solitary, also suitable as a tall trimmed hedge. Shoots of good taste. Culms used for light-weight constructions, tools, ladders, and furniture-making. This bamboo species is not yet identified and has no valid botanical name, or it has been misidentified, consequently misnamed, sometimes as "Bambusa multiplex", "Bambusa nana", or "Thyrsostachys oliveri". "Bambusa nana" — ไผ่เลี้ยงหวาน (phai liang wan), ไผ่ทวาย (phai thawai) — Height to about 12 m, diameter 4-5 cm; dense clumper; habit erect, slightly bending outward, no low branching. A bamboo similar to phai liang, but color of leaves and young culms light to mid green, shoots emerge green, occasionally with a cream stripe. Growth requirements and uses same as phai liang dam. Shoots are said to be more delicious. "Bambusa nana" 'Wiman Thong' (วิมานทอง) — ไผ่เลี้ยงลายทอง (phai liang lai thong) — The most striking ornamental Thai bamboo with striped shiny culms. "Bambusa nana" Quails Garden — A clone from Quails Garden, USA. This over 10 m tall bamboo was assumed to be the same as, or similar to phai liang, but there are considerable differences. Bambusa nutans — Authentic Bambusa nutans, up to 25 m height, 9 cm diameter. Shoots for food, culms for construction. Bambusa odashimae, Bambusa edulis — 烏腳綠竹 (wū jiǎo lǜ zhú), Blackfoot Bamboo — From Taiwan, for shoot production. Bambusa oldhamii, Dendrocalamopsis oldhamii — Thai shoot production strain — ไผ่หยก (phai yok) — Height 10 m, diameter 7-10 cm; clumper; habit upright to V-shaped, slightly bending above, branching throughout, branches short. A bamboo with appealing shoot and culm color. Vivid green culms may turn into golden yellow in strong sunlight. Easy and fast growing, moisture-retentive soil, full sun. The species as grown in Thailand hardly reaches 10 m height, habit is V-shaped with culms not stiffly upright. Shoots delicious, emerge late. One of the best species for shoot production. "Bambusa oldhamii" — US landscape strain — Quite different from the Thai shoot production strain! Culm habit stiffly erect, with drooping tops, up to 20 m tall by 10 cm in diameter. 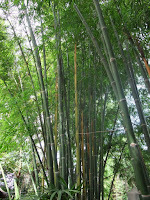 One of the best tall bamboos for landscaping in southern USA, mostly as solitary, but can be also used for screening. Bambusa oliveriana — Native to Myanmar and Thailand. 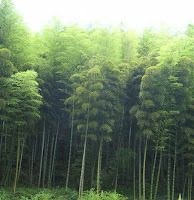 Bambusa pervariabilis × Dendrocalamus daii No. 3 — An intergeneric hybrid from China. Bambusa pervariabilis × Dendrocalamus latiflorus No. 7 — An intergeneric hybrid from China. Bambusa pervariabilis × Dendrocalamus latiflorus × Bambusa textilis No. 1 — An intergeneric hybrid from China. Bambusa pervariabilis 'Viridistriata' — Culms yellow with green stripes. Bambusa polymorpha — 灰秆竹 (hui gan zhu) — ไผ่หอม (phai hom), ไผ่หอบ (phai hop) — Tall bamboo, mainly for construction and handicrafts. Bambusa rigida — From China, similar to Bambusa textilis. Bambusa (?) sp. —   — From Chiang Mai, Thailand. Tight clumper, stiffly erect, over 10 m tall, culms basally solid, leaves small. Received as ไผ่รวกดำ (phai ruak dam). Similar in appearance to Thyrsostachys siamensis and Dendrocalamus strictus, but culm sheaths with conspicuous auricles. Seems to be drought resistant, grows well in full sun to light shade on heavy soil. Bambusa sp. — ไผ่เปร็ง (phai preng), ไผ่คันร่ม (phai kan rom) —  [043-1] — From Thailand, short internodes. Bambusa sp. — ไผ่พรมรอก (phai phrom rok) —  — A wild species of Bambusa from southern Thailand. Open clumper, forming a widespread grove over the years, about 9 m tall. Bambusa sp. —  — An unidentified species of Bambusa from Singapore/Malaysia, very vigorous. Bambusa sp. — [228-1] — An unidentified species of Bambusa from Thailand. Bambusa sp. —  — An unidentified species of Bambusa, similar to B. tulda, from Chiang Mai, northern Thailand. Bambusa sp., long internodes — 长节簕竹 (zhǎng jié lè zhú) — Height 10-16 m, diameter 8-15 cm; cultivated in China; known to tolerate a little frost (to -3 °C was recorded); suitable for subtropical and tropical climates; said to be drought resistant, and good for both shoots and timber. Bambusa sp. 'Maroochy', Dendrocalamus sp. 'Maroochy', Dendrocalamus sp. 'Maroochydore' — From Australia. An unidentified species of Bambusa of unrecorded origin, the cultivated variety found in Australia. 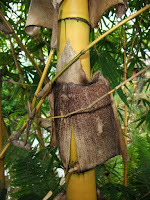 Plants vigorous and tall growing, culms with yellowish stripes, low branching. Bambusa sp. 'Richard Waldron' — Introduced into the USA, unidentified bamboo, of unknown origin, perhaps from China, and perhaps from seed. An ideal bamboo for small gardens and as pot plant; easy-growing, height less than 3 m, leaves small. Bambusa subtruncata — ไผ่หินซิ่นหยี (phai hin sinyi) — From China. Height 4-5 m, diameter 2-2.5 cm. As garden ornamental, for low hedges and screening. Culm sheaths with stripes. Bambusa textilis — Weaver's Bamboo — From China. Height 8 - 12 m, diameter 5 - 6 cm. Culms split for woven ware and basketry; plants as garden ornamental and for screening. Bambusa textilis var. fusca — Dark Weavers Bamboo — Culm sheaths with brown hairs. Bambusa textilis var. gracilis — Graceful Weaver's Bamboo — Smaller in ultimate height, culms slender, diameter less than 3 cm, tops nodding. As solitary garden ornamental, for screening and hedges. Bambusa textilis 'Kanapaha' — Kanapaha Weaver's Bamboo — Culms taller than normal B. textilis, lower half of culm branchless, culm internodes copiously covered with white powder which contributes to a prominent blue appearance. As garden ornamental and for screening. Bambusa textilis 'Mutabilis' — Culms with persistent white powder and long internodes, strong growing. As garden ornamental and for screening. Bambusa textilis 'Scranton' — Clumps more open, branches short. Bambusa tulda — Widely cultivated, height 8-10(21) m, diameter 5-7(10) cm. Grows in full sun, on moisture-retentive soil. Frost resistance to -2 °C was recorded. Culms for construction, scaffolding, furniture, handicraft, basketry, mats, household utensils, and as raw material for paper pulp. Shoots for food (commercial shoot production for pickled vegetables). Plants for wind-break and landscaping. Bambusa tuldoides — Punting Pole Bamboo — From China, height 6-15 m, 3-5 cm diameter. Shoots for diet, culms for light construction, plants for screening. Bambusa variostriata — 吊丝箪竹 (diao si dan zhu) — From China, height 5-12 m, 4-7 cm diameter. Shoots for food; culms for light construction; plants for gardens and landscaping, mainly for privacy screen and natural hedge. Somewhat drought resistant. Bambusa ventricosa — Culm with slightly enflated internodes. Bambusa ventricosa 'Kimmei' — Cultivar originates from Japan. Culms yellow with narrow green stripes; foliage leaf blades occasionally with a narrow cream stipe. Ornamental pot plant. Bambusa vulgaris — ไผ่หลวง (phai luang), ไผ่เขียว (phai khiao) — Common Bamboo — Height 10-20 m, diameter 5-12 cm; clumper; habit erect, slightly bending, branching throughout. Widely distributed. Easy and fast growing, moist or moisture-retentive soil, best in full sun. Culms for construction and scaffolding; leaves for forage; plants for tall visual screen. Shoots are usually not eaten. Bambusa vulgaris 'Striata', Bambusa vulgaris 'Vittata' — ไผ่เหลือง (phai lueang) — Golden Common Bamboo — Height 10-15 m, diameter 5-12 cm; clumper; habit erect, slightly bending, branching throughout. A widely planted and much appreciated ornamental bamboo. Culms bright yellow, randomly striped with dark green of varying width. Easy and fast growing, moist or moisture-retentive soil, best in full sun, but does well in light shade, too. For tall visual screens, or as a solitary ornamental. Culms good for temporary light-weight constructions. Shoots edible (with bitter taste), liked by Vietnamese rather than Thai people. Bambusa vulgaris 'Wamin' — ไผ่น้ำเต้า (phai nam tao) — Buddha's Belly Bamboo — Height 4-8 m, diameter 10-12 cm, usually not taller than 5 m; clumper; habit erect, slightly bending, branching throughout. A widely planted and much appreciated ornamental as for its shortened, inflated shape of internodes on the lower part of culms. Usually, young branches on the lower culms will be removed to accentuate this peculiarity. New shoots may revert into normal shaped culms. Easy growing, moisture-retentive soil, full sun or light shade. Planted as a solitary ornamental, or as a group. Branches and foliage can be trimmed. Culms used for handicraft. Borinda sp. — From high mountains of Yunnan, China, frost-resistant. Height ca. 4 m, diameter ca. 2 cm. Cephalostachyum pallidum, Schizostachyum pallidum — 小空竹 (xiǎo kōng zhú) —  — From China. Plants for landscaping. Cephalostachyum pergracile, Schizostachyum pergracile — ไผ่ข้าวหลาม (phai khao lam) — Height 15 m, diameter 8 cm; dense clumper; habit upright, branches thin, numerous and short. A beautiful bamboo which does not require much space in a garden. Culm sheaths golden yellow on bluish young culms. Native of Thailand. Moisture-retentive soil, sun, light or partial shade. Planted as a solitary or group, best in the light understorey of tall trees. Culm internodes are used as cooking vessels for a Thai sticky rice dish called ข้าวหลาม (khao lam), thus this species has been over-exploited in Thailand. Culms used for light-weight construction and split work. Plants for landscaping. Cephalostachyum pingbianense, Schizostachyum pingbianense — 小薄竹 (xiǎo bo zhú) — From China, height 8 m, for landscaping. Cephalostachyum scandens, Schizostachyum scandens — 真麻竹 (zhēn má zhú) —  — From China. Plants for landscaping. Cephalostachyum virgatum, Schizostachyum virgatum — ไผ่เฮียะ (phai hia) — Height 6-12 m, diameter 4-7 cm; dense clumper; habit erect, bending over, branches thin, numerous and short. A bamboo with attractive habit and medium-sized foliage leaves. Native of Thailand. Moisture-retentive soil, in sun, light or partial shade. Solitary or group, best in the light understorey of tall trees. Culms used for light-weight construction, basketry and split work; plants for landscaping. Chimonobambusa quadrangularis — ไผ่สี่เหลี่ยม (phai si liam) — From southern China, culms nearly square in cross section, runner, for landscaping (groves). Chusquea liebmannii — From Mexico, suitable for subtropical climates. For gardens and landscaping. Dendrocalamopsis basihirsuta, Bambusa basihirsuta — From China. Dendrocalamopsis grandis, Bambusa grandis, Dendrocalamus grandis — From China. Dendrocalamopsis valida, Bambusa valida, Dendrocalamus validus — ไผ่กวางสีแข็งแกร่ง (phai kwang si khaeng kraeng) — From Guangxi, China, offered for the first time in Thailand. This bamboo grows up to 16 m by over 10 cm diameter. It is an excellent landscape bamboo as of its red shoots, ascending erect culms, and unbranched lower part of the culms. Culms are used for construction, and shoots can be eaten. Dendrocalamopsis variostriata — From China, height 5 m, diameter 4 cm, as a garden ornamental, suitable for small gardens. Dendrocalamus asper — ไผ่ตง (phai tong) — 马来甜龙竹 (ma lai tian long zhu) — Tall bamboo, height 15-20 m, diameter 6-20 cm, dense clumper; habit erect, bending, leaves arge, culms densely covered with velvety brown hairs. Easy growing, moisture-retentive soil, full sun. Shoots delicious, widely planted for commercial shoot production. Culms for construction and craft. Plants for landscaping. Dendrocalamus asper cl. Chiang Run — ไผ่ตงเฉียงรุน (phai tong chiang run) — Tall D. asper from Thailand. Dendrocalamus asper 'Betung Hitam' — ไผ่ตงดำบาหลี (phai tong dam bali) — Height 25 m, diameter 20 cm, culms changing to black in the first year. Dendrocalamus asper 'Thai Black Shoot' — ไผ่ตงดำ (phai tong dam) — Shoots thicker than 20 cm, emerge blackish, old culms dark green. Dendrocalamus asper 'Thai Green Shoot' — ไผ่ตงเขียว (phai tong khiao) — Less tall; shoots emerge green. Plants withstand some drought. Dendrocalamus asper cl. Phet Lanna — ไผ่ตงหวานเพชรล้านนา (phai tong wan phet lan na) —  — A selection with sweet shoots. Dendrocalamus barbatus (?) — ไผ่ซางเขียว (phai sang khiao), ไผ่ซางหวาน (phai sang wan) — Height 15-18(20) m, diameter 10-15(17) cm, from northern Thailand. Easy growing, moist or moisture-retentive soil, full sun. Shoots edible, culms for construction. Dendrocalamus barbatus (?) — ไผ่หลวง (phai luang) — From Loei, north-eastern Thailand, but was earlier introduced from Vietnam. Easy growing, moist or moisture-retentive soil, suitable for subtropical and tropical climates. Culms for construction, shoots edible, plants for landscaping. Dendrocalamus barbatus — 小叶龙竹 (xiao ye long zhu) — Height 15-20 m; diameter 10-15 cm, from southern China. Culms for timber production, shoots edible. Dendrocalamus birmanicus — From southern China, height 7-12 m.
Dendrocalamus brandisii (?) —  — Height 20 m or taller, internodes with white velvety when young, of unknown origin, introduced from the USA in 2010. Dendrocalamus brandisii (?) — ไผ่หกใหญ่ (phai hok yai) — [340-1] — From Thailand, height over 15 m.
Dendrocalamus brandisii — ไผ่บงใหญ่ (phai bong yai) —  — From Mae Hong Son, northern Thailand. Height 19-33 m, diameter 13-20 cm, clumper, culms erect, culm sheaths covered with pale white hairs. Easy growing, moist or moisture-retentive soil. Culms for construction, shoots edible. Dendrocalamus brandisii — 云南甜龙竹 (yun nan tian long zhu) —  — From China. Dendrocalamus copelandii — ไผ่มันหมู (phai man mu) —  — Over 10 m tall, from Mae Hong Son, northern Thailand. Dendrocalamus copelandii (?) — ไผ่โปร่ง (phai prong) — [418-1A] — Height ca. 15 m, diameter ca. 15 cm, dense clumper; habit erect, slightly bending, large to medium-sized leaves. Similar in appearance to Dendrocalamus sinicus, but smaller. From Kanchanaburi, western Thailand. Easy growing, moist or moisture-retentive soil, not drought tolerant, grows best in association with tall trees, prefers partial shade but can resist full sun exposure, suitable for subtropical and tropical climates. Culms for construction, shoots edible, plants for landscaping. — Photos. Dendrocalamus copelandii — ไผ่มันหมู (phai man mu) — From Kanchanaburi, western Thailand, and Nan, northern Thailand. So far, these are non-flowering clones. Internodes copiously covered with a white mealy deposit. Dendrocalamus copelandii — ไผ่หวานช่อแฮ (phai wan cho hae), ไผ่ช่อแฮ (phai cho hae) — From Phrae, northern Thailand. Dendrocalamus copelandii (?) —  — Tall Dendrocalamus species from Thailand, received as "phai bong yai", looks similar to D. copelandii, but with light green shoots and without farina. 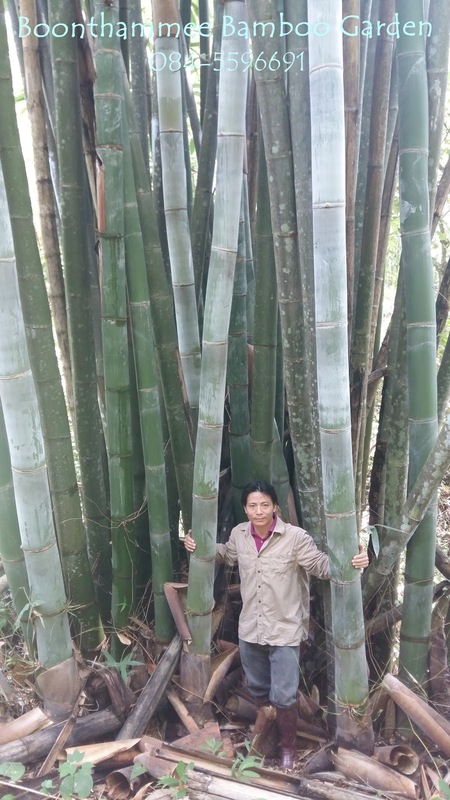 Dendrocalamus dianxiensis — 滇西龙竹 (dian xi long zhu) — Giant bamboo from southwestern Yunnan, China. Shoots delicious; culms for construction and plywood. Dendrocalamus dumosus (?) —  — From southern Thailand, precise location not recorded. Dendrocalamus elegans (?) — ไผ่รวกเขา (phai ruak khao) —  — From Krabi. Dendrocalamus elegans (?) — ไผ่ตัน (phai tan) —  — From Satun. Dendrocalamus elegans (?) —  — From Buboi Island; very low growing, possibly not over 4 m tall, culms arching to the ground. Dendrocalamus elegans (?) —  — From Phuket; height about 10 m, widely arching and clambering into nearby vegetation, small leaves, delicate appearance, culm internodes bluish when young. Dendrocalamus elegans (? ), Langkawi Island population — [288A] — Limestone cliff bamboo, 5 m tall or more, from Langkawi Island, Kedah, northern peninsular Malaysia, culms arching, leaves small, grows well in normal garden soil. Dendrocalamus farinosus — 大叶慈竹 (da ye ci zhu) —  — From southern China, 8-12 m tall, diameter 4-8 cm. Dendrocalamus fuminensis — 大叶龙竹 (dà yè lóng zhú), Large-leaved Dragon Bamboo —  — From Yunnan, China. Dendrocalamus giganteus — ไผ่ยักษ์ (phai yak), ไผ่ยักษ์ปักกิ่ง (phai yak pak king) — Height 20-30 m, diameter 20-30 cm. Plants from various sources in Thailand. Giant bamboo, with possibly the thickest diameter of all bamboo species. Easy growing, moist or moisture-retentive soil. Culms mainly for construction and building purposes, shoots edible. Dendrocalamus giganteus — 龙竹 (long zhu), 大苦竹 (da ku zhu) —  [649-2] — From southern China. Easy growing, moist or moisture-retentive soil, somewhat frost-resistant (to -4 °C was recorded). Dendrocalamus hamiltonii — ไผ่หก (phai hok) — From Thailand. Height 12-23 m, diameter 9-18 cm; culms erect, clumper. Widely distributed in northern India, southern China, Myanmar and Thailand. Easy growing, moist or moisture-retentive soil. 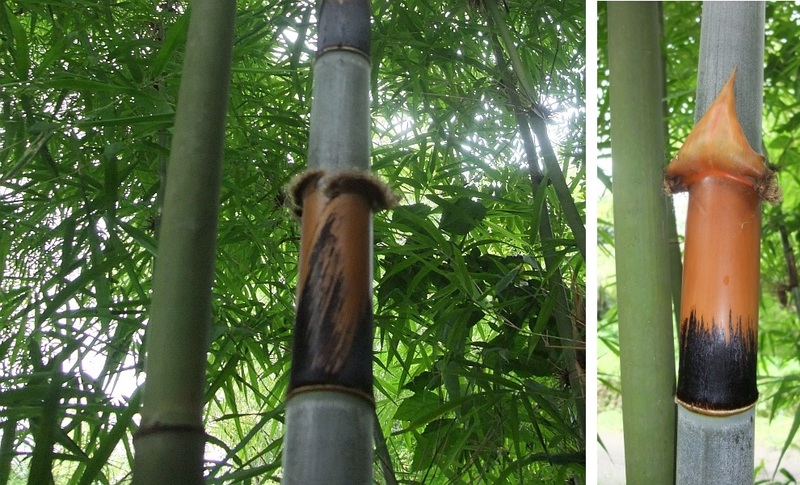 Culms mainly used for construction and building purposes, also for basketry, shoots edible. Dendrocalamus hamiltonii — 版纳甜龙竹 (ban na tian long zhu) — From southern China. Dendrocalamus jiangchengensis — 江城龙竹 (jiāng chéng lóng zhú) —  — From southern China. Dendrocalamus jianshuiensis — 建水龙竹 (jian shui long zhu) — From southern China. Dendrocalamus khoonmengii, Satun population 1 — ไผ่กระโรม (phai krarom), ไผ่ปูนผาตากผ้า (phai pun pha tak pha) — [541A] [541B] — Height 6 m, diameter 2.5 cm, culms erect below, arching in wide bows to the ground, or scrambling into nearby vegetation, internodes solid or with small lumen, leaves small. Native of southern Thailand, on limestone cliffs. Easy growing, grows well in usual, moisture-retentive garden soil with neutral pH, suitable for tropical climates. An excellent ornamental for landscaping, best on steep slopes, edges, terraces. Possibly suitable as a pot plant if culms are allowed to bend over. Dendrocalamus khoonmengii (? ), Satun population 2 —  — Limestone cliff bamboo, 5 m tall or more, from southern Thailand, culms erect with top arching, leaves small, grows well in normal garden soil. 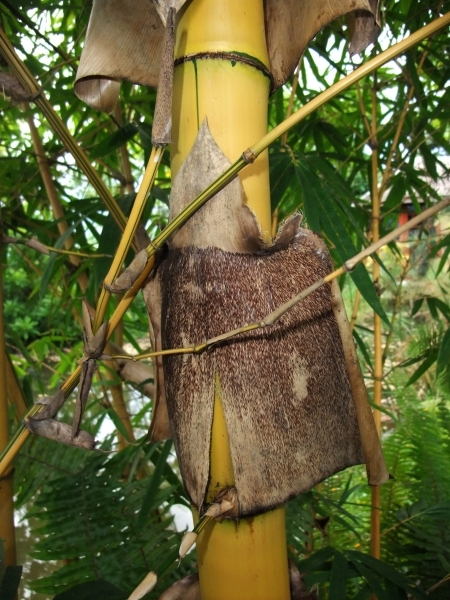 Dendrocalamus maximuslamina — 巨叶竹 (ju ye zhu), 小果龙竹 (xiao guo long zhu) — Giant bamboo in cultivation in China. Height 25-35(!) m and diameter 12-18 cm recorded. Leaves very large. Dendrocalamus membranaceus, Bambusa membranacea — ไผ่นวล (phai nuan), ไผ่ซาง (phai sang), ไผ่ซางนวล (phai sang nuan) — Height 15-20 m, diameter 10-12 cm; clumper; habit erect, bending outward. Widely distributed in northern Thailand. A tall, attractive bamboo with small leaves. Easy growing, moisture-retentive soil, full sun. Shoots edible, culms for construction, plants for landscaping. Dendrocalamus membranaceus 'Grandis' — 细叶龙竹 (xi ye long zhu), 黄竹 (huang zhu) —   — From southern China. Culms taller and more upright. Height 12-20 m, diameter 8-15 cm. Dendrocalamus membranaceus 'Rachini' — ไผ่นวลราชินี (phai nuan rachini), ไผ่ซางราชินี (phai sang rachini), ไผ่ซางนวลราชินี (phai sang nuan rachini) — From Thailand. Height up to 25 m, diameter to 12 cm. "Rachini" is said to be a tall and big growing selection. Commonly planted for scaffolding, furniture-making, chopsticks, toothpicks, fruit-picks, but has ornamental value for landscaping, too. Dendrocalamus membranaceus 'Hai Aphai' (ให้อภัย) — [223-1] — Leaves with sprinkled streaks in white, new shoots in light pink. Dendrocalamus minor f. amoenus — Ghost Bamboo, Angel Mist Bamboo — Height 8 m, diameter 6 cm. Culms with light green stripes obscured by white mealy deposit, thus appearing bluish-grey. An exceptionally attractive bamboo for tropics and subtropics. Dendrocalamus pachycladus — 江竹 (jiāng zhú) "river bamboo" — From southern China. Dendrocalamus peculiaris — 金平龙竹 (jin ping long zhu) — From southern China. Height 13-18 m, diameter 10-15 cm. Culms for construction, furniture, plywood, weaving; plants for landscaping. Dendrocalamus radicosus — 多根龙竹 (duo gen long zhu) — Giant bamboo, from southern China. Height 30 m, diameter 12-18 cm. Dendrocalamus semiscandens — 野龙竹 (ye long zhu) — From Yunnan, China. Height 10-18 m, diameter 10-15 cm. Dendrocalamus sikkimensis — From Sikkim, India. Dendrocalamus sinicus — 巨龙竹 (ju long zhu) — From Yunnan, China. Wild or planted in northern Thailand. 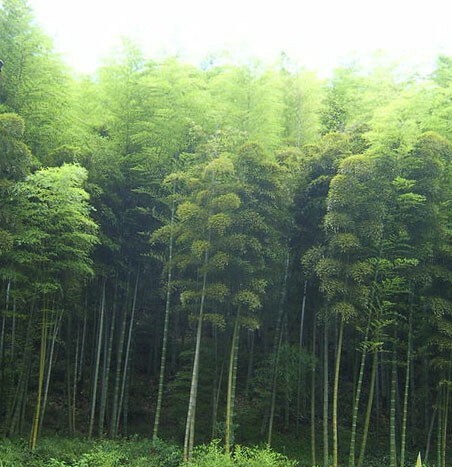 Said to be the tallest bamboo in the world, can reach a height of over 30 m. A culm length of 46 m by 36 cm basal diameter was recorded from Yunnan. Easy growing clumper, on moist or moisture-retentive soil. For construction, beams and pillars, plywood, paper-making; plants for landscaping. Dendrocalamus sinicus (?) — ไผ่โปกเล่าจาง (phai pok lao chang) —  — From Chiang Rai Province, northern Thailand. Dendrocalamus sp. —  — From Phitsanulok, Thailand. Basal culms with oblique nodes. Unidentified Dendrocalamus species. Dendrocalamus sp. —  — From China. Received as "黔竹 (qian zhu), Dendrocalamus tsiangii", but has turned out to be a different, still unidentified Dendrocalamus species. Dendrocalamus sp. — 保山龙竹 (bǎo shān lóng zhú) — Unidentified Dendrocalamus species from Baoshan, Yunnan, China. Dendrocalamus sp. —  — Unidentified, tall Dendrocalamus species from southern Yunnan. Dendrocalamus sp. — 井抗龙竹 (jǐng kàng lóng zhú) —  — Unidentified Dendrocalamus species from Jingkang (井抗), Yunnan, China. Height 20-25 m, diameter 10-19 cm. Dendrocalamus sp. —  — Unidentified, tall Dendrocalamus species from northern Vietnam. Dendrocalamus sp. —   — Unidentified, tall Dendrocalamus species from Laos. Dendrocalamus sp. —  — Unidentified Dendrocalamus species from western Java, Indonesia, similar to D. membranaceus. Dendrocalamus sp., long internodes — 南亚龙竹 (nán yà lóng zhú) —   — Height 20-30 m, diameter 12-20 cm, internode length 40-95 cm. An unidentified giant Dendrocalamus species from Bengal (Bangladesh and West Bengal, India). Dendrocalamus sp. "Sang Mon" — ไผ่ซางหม่น (phai sang mon) — Height usually over 15 m, diameter over 10 cm; clumper; habit erect and perfectly upright, slightly bending above, resembles Dendrocalamus giganteus. Dark green culms and foliage, young culms with white mealy deposit, culms thick-walled. Easy growing, moisture-retentive soil, full sun. Culms for house construction and furniture, mainly planted in Thailand for producing chop-sticks and tooth-picks. Shoots delicious. The plant has much ornamental value and used for landscaping, very suitable for tall screening. This bamboo species is not yet properly identified and commonly misnamed as Dencrocalamus "sericeus" (D. sericeus from India is actually a variety of D. strictus). 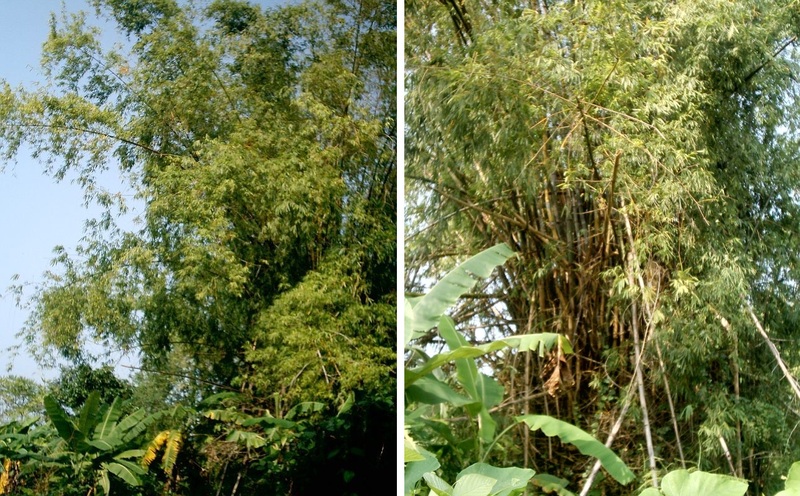 Dendrocalamus strictus — ไผ่ซาง (phai sang) — Male Bamboo, Calcutta Bamboo — Height 6-15 m, diameter 3-7 cm; clumper; habit upright, slightly bending, branching from base up, dark green culms, small leaves, culms and branches solid or nearly so. Easy growing, moisture-retentive soil, full sun, very drought-resistant. Culms to be used in Thailand for any type of light construction or household, farm and garden tools. Dendrocalamus tibeticus — 西藏牡竹 (xi zang mu zhu) — From Tibet, China. Height 12-25 m, diameter 12-18 cm. Dendrocalamus xishuangbannaensis — 版纳龙竹 (ban na long zhu) — ไผ่ยักษ์สิบสองปันนา (phai yak sip song pan na) —  — Giant species from southern Yunnan, China, similar to Dendrocalamus giganteus. Economically important for construction and furniture-making. Dendrocalamus yunnanicus — 云南龙竹 (yun nan long zhu) — Giant bamboo from Yunnan, China. Height 18-25 m, diameter to 18 cm. Dinochloa malayana — ไผ่ดำเลื้อย (phai dam lueai) — Height 8-12 m, diameter 2 cm; clumper and climber, winding up trees, young shoots purplish-black. Easy growing, in light or deep shade, seems to prefer moist soil but might be adapted to seasonal drought. A good plant to add a wild-tropical ornamental feature to a garden with tall trees. Dinochloa mengyangensis — 勐养藤竹 (meng yang teng zhu) — Clambering, from Yunnan, China. Dinochloa sp. —  — Clambering, from Trang, southern Thailand. Gigantochloa albociliata — ไผ่ไร่ (phai rai) — From Thailand, height 7-10 m, diameter 1.5-5 cm. Easy growing, moist or moisture-retentive soil. Shoots palatable, culms for light construction, furniture-making, and farm tools. Gigantochloa atroviolacea — ไผ่ดำอินโดนีเซีย (phai dam indonisia), ไผ่ดำชวา (phai dam chawa) — From Indonesia, height over 10 m, culms dull black with an occasional green stripe. Suitable as an ornamental garden plant. Gigantochloa balui — From southern Thailand, height 10-12 m, diameter 6-8 cm. Suitable as an ornamental garden plant. Gigantochloa densa — ไผ่ผาก (phai phak) — From southern Thailand. Gigantochloa hasskarliana — From Langkawi Island, Malaysia, height 8-12 m, diameter 3-6 cm. Gigantochloa kuring (?) — From Langkawi Island, Malaysia. Gigantochloa latifolia — From Langkawi Island, Malaysia, height 6-10 m, diameter 2-4 cm. Gigantochloa levis — This bamboo grows in lowland Malaysia, Indonesia, and the Philippines, up to 1,000 m altitude, is often planted but might be offered the first time in Thailand. This bamboo grows up to 15 m and more, with diameter over 10 cm. It is easy growing and requires sufficient water. Culms are used for many purposes, and shoots are edible. Plants can be used for landscaping, and are especially suitable as wind-break. Gigantochloa ligulata — From southern Thailand. Gigantochloa ligulata, sprawling and vining —  — From southern Thailand, height 6-9 m, diameter 2-4 cm. Culms striped. Suitable as an ornamental garden plant. Gigantochloa marga — Tiger Stripe Bamboo — From Indonesia. Gigantochloa nigrociliata — From Langkawi Island, Malaysia, height 8-15 m, diameter 4-10 cm. Gigantochloa pseudoarundinacea, Gigantochloa verticillata —   — From Indonesia. Culms striped. Gigantochloa ridleyi — From Singapore/Malaysia, height 16 m, diameter 10 cm. Suitable as an ornamental garden plant. Gigantochloa robusta — Introduced from Indonesia. Gigantochloa scortechinii — From the Malay Peninsula. Gigantochloa scortechinii (? ), striped culms —  — From southern Thailand. Gigantochloa serik — From Indonesia. Gigantochloa sp. — From China, plants raised from seeds. The seeds were received under different names. Possibly a species of Gigantochloa, and similar to G. apus. Attractive for landscaping. Gigantochloa sp. —  — Unidentified Gigantochloa species from Malaysia. Gigantochloa sp. —  — Unidentified Gigantochloa species from Satun, southern Thailand. Gigantochloa sp. —  — Unidentified Gigantochloa species from Singapore/Malaysia. Gigantochloa sp. —  — Unidentified Gigantochloa species from Yala, southern Thailand. Shoots fuzzy. Gigantochloa sp. — ไผ่มัน (phai man) — Unidentified Gigantochloa species from southern Thailand. Gigantochloa sp. — ไผ่นกเขา (phai nok khao) —  — Unidentified Gigantochloa species from Thailand. Gigantochloa sp. — ไผ่ยาว (phai yao) —  — Unidentified Gigantochloa species from Satun, southern Thailand. Gigantochloa sp. —  — Unidentified Gigantochloa species from southern Thailand. Gigantochloa sp. —  — Unidentified Gigantochloa species from southern Thailand, similar to Gigantochloa balui. Gigantochloa sp. —  — Unidentified Gigantochloa species, received as Neohouzeaua mekongensis. Gigantochloa sp., black culms — ไผ่ดำลำตัน (phai dam lam tan) — Unidentified Gigantochloa species from northeastern Thailand; culms black and solid. Gigantochloa sp., brown culms —  — Unidentified Gigantochloa species from southern Thailand; culms brownish. Gigantochloa sp., striped culms — from Kanchanaburi —  — A wild unidentified species, grows very tall (height not recorded) and upright, has striped culms from base to top (stripes yellow, basal stripes can be violet), and very large leaves, branching from base up. Gigantochloa sp., striped culms —  — Unidentified Gigantochloa species with nicely striped culms from southern Thailand. Culms may reach up to 10 m height or little more, bending or arching above. This bamboo may turn out to be salt-resistant to some extend as it grows close to the coast. A good ornamental garden plant. Gigantochloa sp., striped culms —  — Unidentified Gigantochloa species with nicely striped culms from Songkhla, southern Thailand. Culms over 10 m tall. Gigantochloa sp., striped culms and leaves —  — Unidentified Gigantochloa species with striped culms and leaves, from Trang, southern Thailand. Gigantochloa sp., striped culms and leaves —  — Unidentified Gigantochloa species of medium height with striped culms and leaves, from southern Thailand. Gigantochloa sp., green culms and leaves — [601A] — Seedling of . Gigantochloa sp., striped leaves —  — Unidentified Gigantochloa species with striped leaves, said to originate from Thailand, known as "Bambusa suberecta". Height unknown, possibly low growing, culms bending. Gigantochloa sp., curved culms —  — Introduced from Australia, received as "Gigantochloa ridleyi, culms curved", but it is apparently a Gigantochloa species different from G. ridleyi. Gigantochloa sp. 'Hitam Hijau' —  — Unidentified Gigantochloa species from Indonesia. Gigantochloa wrayi 'Impian' — From the Malay Peninsula. Culms striped. Guadua angustifolia, Bambusa guadua — Guadua Bamboo — A very tall, erect, open-spaced thorny bamboo from South America, where it is widely grown for timber production. Culms are very hard and used for all construction purposes, plants used for landscaping. Guadua angustifolia 'Bicolor', Guadua angustifolia var. bicolor, Guadua angustifolia 'Joseph de Jumonville', Guadua angustifolia 'Striata' — Striped Guadua Bamboo — From Colombia, South America. Culms with yellow stripes. Guadua angustifolia 'Less Thorny' — ไผ่กวาดวะหนามน้อย (phai kwadwa nam noi) — From South America. Culms and branches with fewer and much smaller thorns. Guadua velutina —  — From Mexico. Height 16 m, diameter 10 cm, open clumper, culms thick-walled, culm sheaths maroon, persistent on lower culm. Culms for high quality, heavy constructions. Indocalamus tessellatus — 箬竹 (ruò zhú) —  — Runner, ground-cover plant with very large leaves, from eastern China. Does not do well in tropical climate. Indosasa sinica — 中华大节竹 (zhōng huá dà jié zhú) — [765-1] — Runner, tall growing, from southern China. Plants used for landscaping. Indosasa (?) sp. —  — Runner, from Phrae, northern Thailand. Lingnania cerosissima, Bambusa cerosissima — 箪竹 (dān zhú) — [750-1] — From China, for landscaping. Lingnania distegia, Bambusa distegia — 料慈竹 (liào cí zhú) —  — From China, for landscaping. Lingnania funghomii, Bambusa guangxiensis — From southern China, up to 5 m tall, for weaving, for low hedges and screens, suitable for topiary and as pot plant. Lithachne pauciflora — A very low, herbaceous bamboo, widely distributed from southern Mexico and the Caribean Islands to southern South America. Requires shade, moist soil, and high air humidity. Maclurochloa montana — From northern Thailand. Melocalamus arrectus — 澜沧梨藤竹 (lan cang li teng zhu) — A clambering, understory bamboo from southern China. Melocalamus compactiflorus — 梨藤竹 (lí téng zhú) — A clambering bamboo from southern China and Thailand. Melocalamus (?) sp. —  — From Khao Yai National Park, Prachinburi, Thailand. 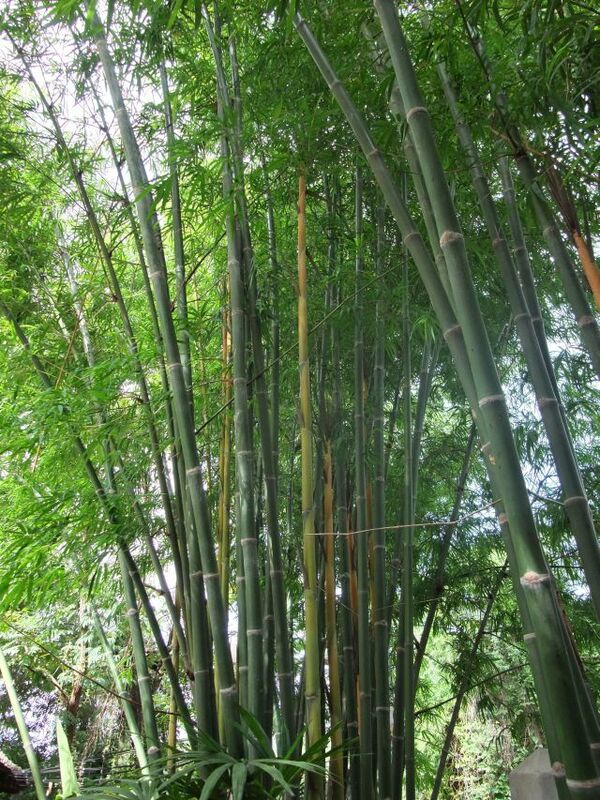 Open clumper, about 10 m tall bamboo, basally erect culms, upper culms clambering, thin-walled, used for basketry. Nastus elatus — ไผ่รวกปาปัว (phai ruak papua) — From Papua New Guinea. Neohouzeaua fimbriata — From southern Thailand. Neohouzeaua kerriana — ไผ่ราชวัง (phai rachawang) — From southern Thailand. Neohouzeaua (?) sp. — ไผ่แข่่กวาง (phai khae kwang) —  — From northern Thailand. Neololeba atra — An understorey bamboo of about 10 m height with striped culms and large leaves, from tropical Australia and Papua New Guinea, prefers shade and rather moist soil. Olmeca recta — ไผ่โอลเม็คคะยิมบา (phai onmekka yimba) — Jimba — From Mexico, requires (light) shade and moist soil. 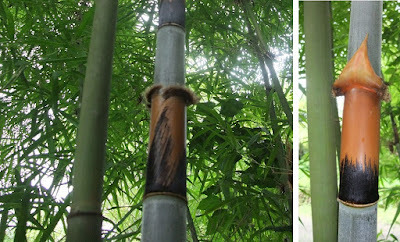 Oxytenanthera abyssinica — African Savanna Bamboo — 酒竹 (jiǔ zhú), Wine Bamboo — From Africa, height 3-10 m, diameter 5-10 cm, a very useful, widespread bamboo in tropical Africa. Phuphanochloa speciosa — ไผ่ภูพาน (phai phu phan) — A native of northeastern Thailand. Phyllostachys aurea — ไผ่เหลืองจีน (phai lueang chin) — For ornamental grove bamboo (runner) for warm-temperate zones, or higher altitudes in Thailand. Phyllostachys edulis, P. pubescens — 毛竹 (máo zhú) — ไผ่ขน (phai khon) — Moso Bamboo — From China, economically very important bamboo for shoot and timber production, for landscaping (runner, forming groves), not suitable for tropical lowlands. Phyllostachys makinoi — ไผ่มากินหน่อย (phai makinnoi) — Makino Bamboo — Introduced from Taiwan. Grove bamboo (runner) for warm-temperate zones, or higher altitudes in Thailand. Phyllostachys nigra f. nigra — ไผ่ดำจีน (phai dam chin) — Chinese Black Bamboo — Black-culm ornamental grove bamboo (runner) for warm-temperate zones, or higher altitudes in Thailand. Height 10 m, but lower in tropical climate. Pleioblastus fortunei 'Pygmaeus' —  — Runner, a very low growing bamboo from eastern China, can be used as a groundcover plant, very invasive in temperate climates. Pseudosasa (?) sp. —  — Runner, an unidentified species from Doi Inthanon (Thailand's highest mountain), about to 4 m tall, with medium-sized, dark green leaves. Pseudosasa (?) sp. — ไผ่หลอด (phai lot) —  — Runner, an unidentified species from Loei, northeastern Thailand, about to 4 m tall, with medium-sized, dark green leaves. Possibly the same species as those from Doi Inthanon. Schizostachyum brachycladum 'Bali Kuning' — ไผ่ทอง (phai thong) — Height 10-12 m, diameter 5-8 cm; clumper; habit upright, lower part almost branchless, branches short, leaves large. An outstanding ornamental with yellow culms, usually with a few narrow green stripes, leaves occasionally with a narrow yellow stripe. Best as solitary, or alley; grows well in full sun on moist soil, or in partial shade. Culms used for craft and split-work. Schizostachyum brachycladum 'Ratchaphruek' — ไผ่เขียวอมร (phai khiao amon) — Ornamental bamboo with yellow-striped green culms, about 10 m tall; best as solitary; grows well in full sun on moist soil, or in partial shade. Schizostachyum diffusum — 莎簕竹 (shā lè zhú) —  — From southern China. Schizostachyum funghomii — 沙罗单竹 (sha luo dan zhu) — From China, attractive bamboo with large leaves, young shoots black, plants for landscaping, best in partial shade. Height 13-18 m, diameter 5-8 cm. Schizostachyum grande — ไผ่ตากวาง (phai ta kwang), ไผ่เหมียง (phai miang) — Deer Eye Bamboo — From southern Thailand (Songkhla and Satun) up to 1,000 m altitude; height 12-20 m, diameter 7-12 cm, culms arching over in a wide bow, leaves very large; shoots delicious; culms said to be very durable under moist conditions, used as water pipes and roofing; plants for landscaping. Schizostachyum hainanense —  — From Hainan, China, height 8-20 m, diameter 2-4 cm, arching, grows well in heavy moist soil exposed to little sun. Schizostachyum iraten —  — From Malaysia, height 6-10 m, diameter 2-5 cm, with internodes 0.7-1.2 m long, prefers light shade. Schizostachyum jaculans — From Malaysia, height 7 m with internodes up to 1 m long, prefers light shade. Schizostachyum sp. —  — From Kanchanaburi, western Thailand. Schizostachyum sp. 'Kluang Supat' — From Indonesia, height only 3-4 m, habit V-shaped, for small gardens and for landscaping, grows well in light shade and moist soil. Schizostachyum lima — Widely distributed from the Philippines to Papua New Guinea, height to 13 m, diameter to 4 cm, thin-walled, easy-growing, prefers light shade. Schizostachyum sp. —  — From Satun, southern Thailand. Schizostachyum sp. —  — From southern Thailand, wild. Low growing, very similar to Murray Island Bamboo. Schizostachyum sp. —  — From southern Thailand. Tall growing. Schizostachyum (?) sp. —  — From Yala, southern Thailand. Schizostachyum zollingeri — From southern Thailand, height 15-20 m, diameter 8-10 cm, arching; as a garden ornamental and for landscaping. Sinobambusa tootsik —  — Natural or naturalized in northern Thailand, runner, forming groves. Culm height 5-12 m, diameter 2-6 cm. Sinobambusa tootsik 'Suzukonarihira' — Leaves striped. Grown in northern Thailand, runner, forming groves. Thyrsostachys siamensis — ไผ่รวก (phai ruak), ไผ่รวกใหญ่ (phai ruak yai) — Monastery Bamboo — A tall growing variety: Height 12-13 m, or much taller (to 25 m was recorded), diameter 4-6(8) cm. Very dense clumper, habit stiffly upright, slightly bending above, no low branching, culm sheaths persistent on lower culm. Used for visual screen, hedge, wind-break, ornamental solitary or group; shoots edible; culms for light-weight construction, craft, tools and furniture-making. A common bamboo in Thailand, wild and often planted. Usually named Thyrsostachys oliveri, but there is currently no evidence that phai ruak yai represents this species. Thyrsostachys siamensis — ไผ่รวกเล็ก (phai ruak lek) — Little Monastery Bamboo — Smaller in height and diameter: Height to 7 m, average diameter 2.5 cm. Very dense clumper, habit upright, slightly bending above, no low branching, culm sheaths persistent on lower culm. Used for visual screen and hedge, ornamental solitary or group; shoots edible; culms for tools and furniture-making. Widespread in Thailand, wild and often planted. Thyrsostachys siamensis 'Wealthy Siamese' (เวลธีสยามอีส) — ไผ่รวกเศรษฐี (phai ruak setthi) — Culms striped. Vietnamosasa ciliata — From Nong Khai. Runner, wild from the Mekong River area of northeastern Thailand.